Here we have given solution for How to Fix Toilet Won’t Stop Running After Flush. You notice that even after flushing the toilet 5 minutes ago you still hear the toilet running. Most of the times you just jiggle the handle a little and it will fix the problem of toilet running. But many times it won’t fix the issue of Toilet Won’t Stop Running After Flush. This issue will waste the water and hence your water bill will increase. We have given the detail step by step method to resolve this water running problem. Please read below for detailed solution. This issue can be easily fixed easily and quickly by using only few common tools. Before starting the troubleshooting you need to know the parts of toilet so that you can have all the knowledge before you start. 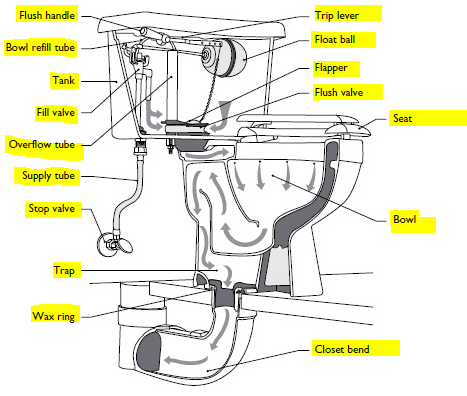 The Fill Valve can be found at the left side of the inside side of the toilet tank. you can see it is connected to the pipeline and its main function is to fill the toilet with water once you have flushed. The float is attached to the fill valve which is mentioned above. When you flush the toilet, this device will sink with the water level. So after flushing the water when comes back to the tank, and it will stop the water from overfilling. It is located at the center of the toilet tank. A flapper will cover it which opens when the toilet is flushed. WHen the flapper is open, it allows the water to go from tank to the bowl for flushing. After flushing the water tank will become empty and flapper will be closed which helps in filling the tank again. There is a seal which is between the flush valve and the flapper which stops the water leakage from tank. If the toilet flapper is faulty then water can leak from the water tank, If you notice any bumps or irregularities in the flapper then you have to remove and replace it. You should make sure that the edges of the toilet flapper is smooth and can be fixed in the flush valve tightly. A good properly sealed flush valve will enable the float to go down with water and tells the water tank when it needs to be refilled again. If this seal is faulty or broken then it will cause water leakage and you will face Toilet Won’t Stop Running After Flush issue. Its very easy to fix. First please turn off the water supply to the toilet and now flush the toilet to empty the tank. Now buy a new flapper and replace it. Turn on the water supply and thats it. If you have inspected the Toilet Flapper then you need to check the Toilet Flapper Chain. This chain connects the toilet to the handle of the toilet flapper. When you want to flush, you pull the handle which start the chain and it opens the flapper which allows water to go from tank to the bowl. Sometimes this chain becomes long and due to length it can be come tangled or it can get stuck between valve and toilet flapper. When this happens the seal is broken and will cause the tank to leak. So to fix this issue you need to decrease the length of chain by reducing the clack of chain from where it is connecting to the handle. To do this, just move the clip which connects the handle to chain a little bit down. You can also remove some extra chain to decrease the length. It will solve the issue. If you have checked the Toilet Flapper and the chain and found them properly working but still getting the issue of water running then it may be due to the water level inside the toilet tank. The normal level of water level should be about 1/2 inch to 1 inch below the overflow pipe in the water tank. Check if its level is too high then specified then it causes imbalance and you will hear the constant water running sound from the toilet. So for fixing this issue you need to adjust the float height. There will be a screw which main purpose is to connect the toilet float to the toilet fill valve. So to adjust height just turn the screw at clock wise direction so that it is at appropriate height. If the toilet float has metal arm which connects water fill valve, then you can try bending the arm which will help in lowering the level of toilet float which will adjust the water level. READ [SOLVED] Washing Machine Using Cold Water When Set To Hot - How to Fix? We hope that now your are able to fix the Toilet Won’t Stop Running After Flush. Please do visit for other home diy. Please do comment for any questions or suggestions.